HomeSEO / SEMSearch Engine OptimizationImage SEO; How to optimize images for search engines? What is RankBrain? Planning to optimise the website for RankBrain? Image SEO; How to optimize images for search engines? With the increasing efficiency of Google crawlers, the process of getting better ranks of your websites has really become a tough job. One really needs to optimize the website for mobile, voice, images, content, structure and many more. Image optimization, an important parameter which influences Google ranking is basically a list of long and easy steps which you must take to compile your images into a web friendly format so that the ranking of your page increases. Name your images: Yes, it is mandatory to name your images and name should describe what actually they are. For example, an image of Toyota Innova should be saved by this name only rather than by some DSLR3456.jpg. By naming the image you exactly get to use the keyword at the right place and Google also comes to know what exactly the image is. Thus, choose the right name for your image in between 4-5 words and enjoy the beginning of image SEO process. Scale your images: Loading time of your website plays a very important role and images have a huge impact on it. Maximum visitors wait about 3 seconds on a desktop and 5 seconds on their mobiles for a website to load. Now in this case if you over stuff your article with huge images then the website will take a lot of time to load. Therefore, it is advised to scale your images effectively by the use of WordPress so that it gets easier and quicker to visit a page. Reduce the file size: For proper image SEO, the scaled image should be served in the smallest file size possible without compromising on the quality of it. You can do this by removing the EXIF data or by taking help of other websites like PunnyPNG or JPEGMini. An image file size below 70kb is apt for an e commerce site. Further, the success percentage of your image optimisation can also be checked on YSlow. Captions capture: It is said that captions under the images are read by an average 300% more than the body itself. So, if you not using it then you missing out on a huge number of potential readers. People see this image caption to scan an entire article but should caption be added to every image in the article. No, it depends on what reference the image is used. The caption should definitely accompany the main images but should not follow the other helping images. Add Alt text and title text: There are situations when images are not properly available to readers. Here, this alt text or alt tags display a descriptive text of the image, ensuring that the functionality or information is not lost from the readers. They are very useful to not let go your reader away. Make sure you always add them and use the SEO keyword of the image in it. You can write about the main attributes of the image but can also add some non-essential information here. 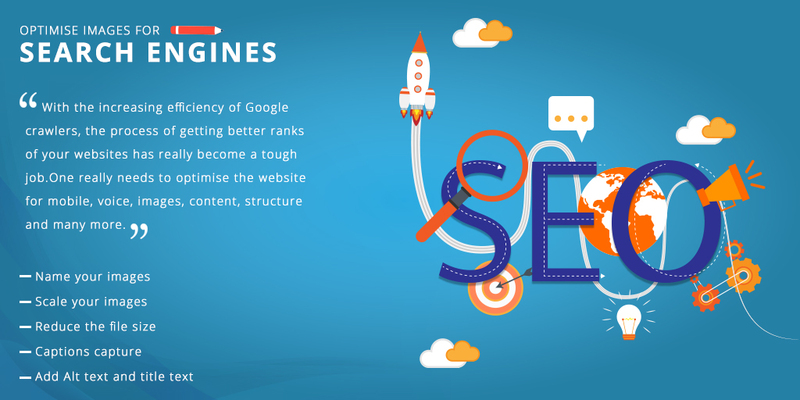 What’s missing in your SEO Strategy #infographic ?